Pro-life group raps Pelosi "celebration tour"
Washington, Jan. 3, 2007 (www.CWNews.com) – An American pro-life group has appealed to three different US archbishops, urging the prelates to stop a “celebration tour” by the incoming Speaker of the US House of Representatives, a Catholic politician who supports abortion. "It is unconscionable for Rep. Pelosi to claim that the Catholic faith is an important part of her life while she relentlessly, categorically denies the teachings of the Church by supporting the killing of children through abortion," said Judie Brown, president of ALL. The group has placed a full-page ad in the Washington Times urging Church leaders to speak out in order to prevent the confusion and “grave scandal” that could arise from Pelosi’s stance. The ALL plea was directed to Cardinal William Keeler of Baltimore and Archbishop Donald Wuerl of Washington, DC– the two prelates in whose archdioceses the “celebration tour” will make stops– and Archbishop George Niederauer of San Francisco, where the incoming Speaker makes her residence. Heavenly Father, grant that our priests be strengthened and healed by the power of the Eucharist they celebrate. May the Word they proclaim give them courage and wisdom. Mary, Mother of the Church, look tenderly upon your sons, your priests. Joseph, patron of the Universal Church, pray for us all. Yesterday I watched the docomentary entitled Obsession: Radical Islam's War Against the West. It was not a pretty movie — in the sense of making you feel warm and fuzzy, or more in love with your wife. Rather, it was disturbing — the kind that makes you wake up and smell the smoke. 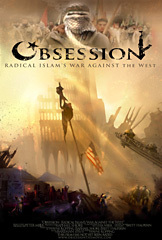 If you haven't seen Obsession and you still think that Islam is not a threat, then you should get a hold of this DVD and watch it, or give it to a friend. I am not sure where to get a copy. I bought mine on Amazon. But this is the link and you can learn all you need to from clicking here or on the DVD cover. I think everyone should watch this and be aware of the smoke that is rising.